This Saturday’s Milan-Sanremo is all about is tense finish, the paradox of the longest race of the year that’s often decided in the final metres, a race where every pedal stroke counts and the list of contenders and pretenders is long as grand tour contenders, classics specialists and sprinters start with ambitions. Who will ride the perfect race? The Route: 291km plus the processional ride start make 300km. The race traverses the vast Po valley, the Pianura Padana that grow much of Italy’s rice crop. At 117km Ovada marks the start of the long Passo del Turchino. It used to be important to the race but it’s a slow and gradual climb, a railway runs alongside. Turchino means a shade of blue in Italian, hinting at the Mediterranean sea that awaits on the other side. The pass is a symbolic moment of passage, lifting riders away from the wintry plains to the Mediterranean with its palm trees and blooming flowers, winter to spring over one pass. There’s a stressful descent with tunnels to the outskirts of Genova. The halfway point is crossed but the finish feels closer, the coastal road familiar. The race goes from one town to another, negotiating modern street furniture and antiquated town squares alike. The cape trinity: Capo Mele, Capo Cervo and Capo Berta are small climbs but serve as landmarks to break up the flat road and by now the race has done 250km. Then it’s on to the Cipressa (more detail). This starts with sharp right hander and quickly climbs through olive groves above the coastal town of San Lorenzo, the 9% gradient bites hard after 270km. This is a proper moment of climbing that ejects sprinters, the average of 4% is a blend of a steep start and a flat portion over the top where dropped riders flounder. There’s a toboggan descent, the most technical part of the entire course. The race continues along the coastal road, the Via Aurelia where riders jostle for position for 9km before the final climb. 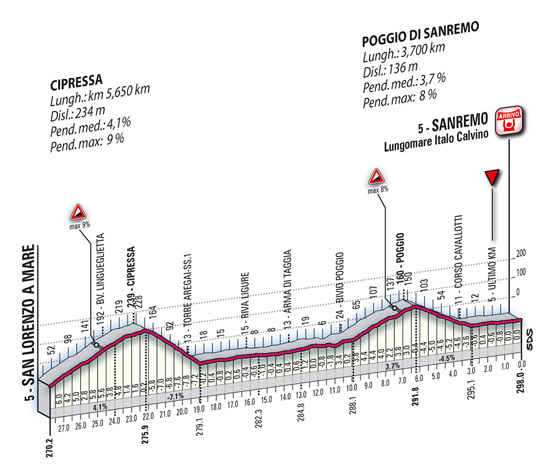 The Poggio (more here) starts with 9.2km to go and marks the final phase of the race. A furious pace is inevitable. A right flick off the main coastal road is followed by series of wide bends that are so fast some riders have to brake before entry despite going uphill. Positioning is everything as the road winds up, every metre matters. Unlike the Cipressa this isn’t steep, there’s only one short step at 8% but this is often exploited as the place to attack. After 285km the peloton’s elastic is like a old rubber band and the Poggio is just enough snap things. The descent is fast and marked by a series of curves and five hairpins. The race has been won on the descent before and it has its technical moments, for example knowing which bend has the sunken inspection cover on the exit line helps, but this is not for virtuoso descenders, instead it suits those with power, a series of sprints out of every corner. Carrying speed into the bends matters but what matters more is being able to pump out big watts on every exit. The ramp ends with fast junction onto the main road. The Finish: under the 1km banner and it’s left at the fountain, then right on the big wide Via Roma, the scene of wins by Merckx, Coppi, De Vlaeminck et al, it has the slightest of slopes up to the finish line. The Scenario: a bunch sprint? If only it was so simple. The chart above shows the size of the front group in Sanremo over the years (note 2008-2013 included the additional climb of Le Mànie which thinned things). It shows any “bunch” sprint is really a reduced group, typically the Poggio reduces the race to 20-40 riders. With seven hours in the legs the resulting sprint is a test of force and energy rather than speed and few have a team mate left to lead them out. We’ll see an early move go clear. Look to see which teams place riders in it and if there are any big engines in the move to keep it clear for as long as possible. As ever the pace ratchets up along the coastal road, on TV you might see a bunch of riders, the trick is to spot which teams still have plenty of riders and who is well placed. Onto the Cipressa where no winning move has worked since 1996. It’s still strategic, a chance for teams to play some cards, for climbers to put on a show for TV. The harder the pace, the more the sprinters will struggle. It’s got some steep sections where it’s easy to crack and then lose 30 seconds over the flat section to the village of Cipressa: game over. There’s always a danger moment on the flat coastal approach to the Poggio as a move can slip away while others get into position, everyone wants someone else to chase. The Poggio’s early slopes can look slow on TV but chances are the bunch is going full gas as riders rub shoulders and elbows to jostle for position. The best attacks come late on the steepest part after the chapel on the left and a breakaway only needs 10 seconds over the top to stay away. It’s easy to cite the contenders but hard to pick a winner. The beauty of this race is that so many start with a hope but converting this into victory is a delicate affair, a few pedals strokes here, a touch of the brakes there and it is game over for another year. Julian Alaphilippe (Deceuninck-Quickstep) seems the obvious pick. He’s in top form having recently taken the Strade Bianche and two stages of Tirreno-Adriatico, including a bunch sprint. 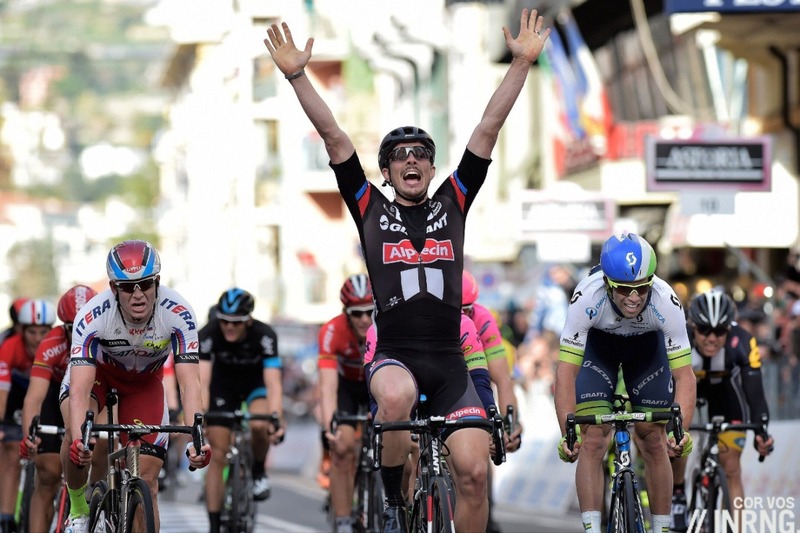 He’s been on the podium in Sanremo before so knows the race, plus comes with a strong team. So far, so good, but it’s not going to be easy, his team is so strong that Alaphilippe will have to seize the moment or fold in to help them. This means an attack on the Poggio and he’ll have a queue of rider on his wheel but if anyone can shake them it’s him, he’s got the jump and the skills for the descent and finishes well in a sprint. Sanremo rhymes with surprise and Alaphilippe won’t have this. Philippe Gilbert’s not got the searing acceleration of his younger years but could try from further while Zdeněk Štybar brings more options and has found winning ways again, he could be the one to benefit from marking. Peter Sagan (Bora-Hansgrohe) is an obvious pick, able to go on the Poggio, at ease on the descent and powerful in the sprint but he often places more than he wins and he’s gone into Sanremo many people’s prediction but is yet to win; see how he lost in the sprint to Michał Kwiatkowski two years ago. Now he’s cited more on reputation than form because he had a discrete Tirreno-Adriatico and was sick before, but he seems to be someone capable of beating others even when he’s short of form. With Sam Bennett also on the team it looks like Sagan will be tasked with making a move on the Poggio or its descent rather than waiting for a bunch sprint, the Irishman has a chance in the sprint, he’s versatile on hilly courses and has beaten the big name sprinters several times but is still far from the certainty of rival sprinters. Now to the sprinters who dream of a bunch finish. There are several teams who will work for a bunch finish, riding a high tempo in order to deter attacks and keep things steady for their house sprinters. 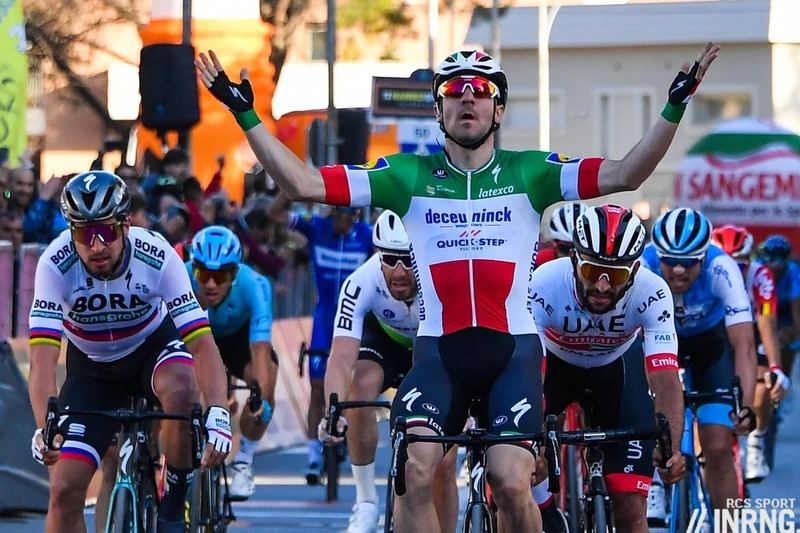 Elia Viviani (Deceuninck-Quickstep) has made this a target and would delight the home fans, he’s having a great season and can manage a climb or two, it’s how he won his Italian champion’s jersey but the distance is his enemy, he seems to get blunt after five hours. Caleb Ewan (Lotto-Soudal) has made Milan-Sanremo his big objective after finishing second last year, he seemed to sprint like he’d been shot out of a cannon. Now he comes with a full team in his service, something different from last year. But no two editions of Sanremo are the same and second one year doesn’t guarantee much the next, he’s had a good start to the season but only one win. Fernando Gaviria (UAE Emirates) seems like the prototype sprinter for Saturday, at ease on short climbs which cause others distress and on a good day he can be the fastest in the world in a flat finish, plus he comes with Alexander Kristoff, a previous winner who on paper brings more options but is becoming a lead-out deluxe for Gaviria. Arnaud Démare (Groupama-FDJ) has won before but his problem is he’s too obvious a sprinter, he’s an ideal wheel to be on thanks to his big frame and his tendency to launch early for a long sprint but what he sometimes lacks in leg speed he makes up for with endurance which counts for plenty here. Dylan Groenewegen (Jumbo-Visma) is a late entrant after a good Paris-Nice and has nothing to lose, if he’s in the mix approaching Sanremo he’s an obvious contender but we’ll see how he fares on the Cipressa and Poggio. Matteo Trentin has had a great start to the season and comes with a Mitchelton-Scott team able to support him but against the names cited already his chances are low in a straight sprint, so does he try an attack? Magnus Cort (Astana) is in a similar position too, ditto Sonny Colbrelli (Bahrain-Merida). 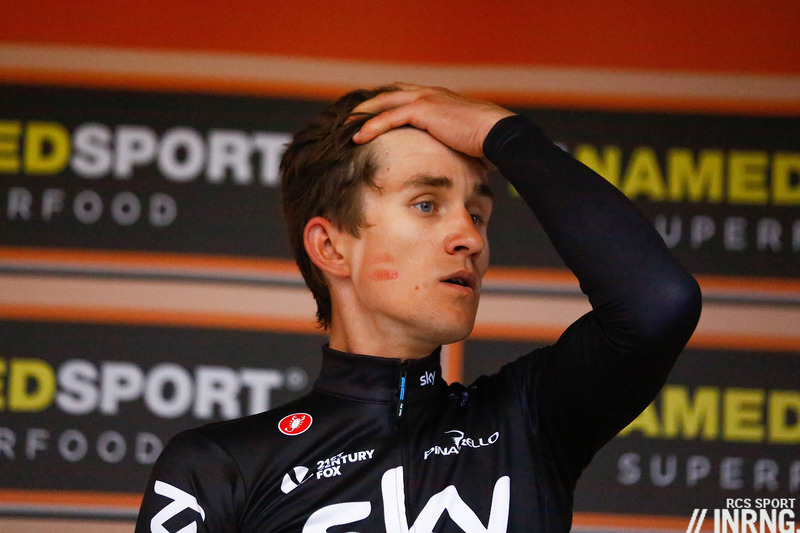 Michał Kwiatkowksi has won before and can do it again, he comes out of a successful Paris-Nice. He won’t take a bunch sprint but he can do pretty much everything else and has a sharp racing brain. Greg Van Avermaet seems an obvious winner given his palmarès, but how to make it happen? Has he got the jump to go clear on the Poggio, maybe but others might accompany him and they could be faster and more crafty in the sprint. Oliver Naesen (Ag2r La Mondiale) looked very strong in Paris-Nice but again, how to win? If the Poggio was cobbled he’d have a better chance. John Degenkolb has won before and had a solid Paris-Nice, his 2015 victory saw him beating sprint aristocracy so it’s possible again but like so many here, we can plot how he might win but the chances of executing it are slim. He leads a strong Trek-Segafredo squad with Jasper Stuyven and Toms Skujiņš longer range options. Alberto Bettiol (EF Education First) is consistently strong but an infrequent winner but seems in form and could play a role. Michael Matthews (Team Sunweb) seems a prototype rider but if there’s a sprint from a group of about 30 he’s unlikely to be the fastest – which explains why he’s been on the podium here but never the top step – so he too could try to go in a Poggio move but he’s had a slow start to the season which doesn’t reassure. Alejandro Valverde (Movistar) starts and perhaps this is why he’s entered the race, to have the rainbow jersey in the race. Otherwise the course looks too flat for him, he lacks the power for a late attack and if he’s sprinting surely someone bigger will get the better of him? Finally last year’s winner Vincenzo Nibali (Bahrain-Merida) has had a quiet start to the season but did just that last year however surely nobody will give him space this time? Weather (update Saturday 8.30am): a cool and sunny day, a fresh start out of Milan and a top temperature of 16°C along the coast later. The wind should be calm, no more than 10km/h and from the south, a slight aid to a Poggio attack. TV: Rai’s coverage begins at 2.00pm CET with four hours of live broadcast with Eurosport doing the international feed. The finish is forecast for 5.05pm CET. Cyclingfans and steephill have guides and links to schedules and streams. How much to watch? Based on past editions you could tune in with 10km to go and watch most of the action unfold, this is the longest race on the calendar but paradoxically the action always seems to happen near the finish: in the last 20 years the furthest from the finish a winning move has been launched is with 7km to go. Tune in early and you get to see the gradual build-up, the team tactics and the surprise implosions of riders dropped on the Cipressa or crashing out on the capes. “Based on past editions you could tune in with 10km to go and watch most of the action unfold, this is the longest race on the calendar but paradoxically the action always seems to happen near the finish” – sometimes it’s good to just watch them ride for a few 100kms. Presume not even a single wheel for Peter Sagan is oversight rather than prediction? Yes, was hesitating over his chances and in the long list he was left off. Fixed now. Even with his illness and lack of form thus far I’d still be tempted to put Sagan as favourite. With his attributes he should win it every year! I think at some point he’ll figure it out and go on a Freire/Zabel type run. I think Alaphilippe would have to win if not solo then in a small group of climbers or lighter punchuers. The last couple of years have been solo and very small group so I’m going to go for a 20-30 bunch sprint this year and a top 3 of Ewan, Viviani and Demare, though not necessarily in that order..! It’s his lack of form that could precisely be the reason he wins this time. Just waits for sprint and no one is better at positioning than him. in the last 6 km Sagan will work for Sam Bennett. Bennett for the win. We’ll see, I think Bora-Hansgrohe would want a win for Sagan as he’s more marketable but if does help then Bennett could have the best gregario/ lead-out in the world. Sagan did his best imitation of a top lieutenant for someone. Or was just cycling not to win. A waste of talent. Your stats being exactly what, I might ask? Who are the othe cyclists that have won solo (as Nibali did last year)? One year, 91 0r 92 maybe, an EPO fuelled Chiaupucci won from so far out his break started pretty much from when he left his hotel room. MSR has probably the most exciting and tense finale of the whole cycling season. On a side note: are there any plans to squeeze the Pompeiana climb between Cipressa and Poggio? This was planned a few years ago but later abandoned because of a landslide. This would probably eliminate all sprinters from the running and I think the organisers abandoned this idea for good because of that, realising that part of MSR’s appeals is that it is open for all type of riders. I think the plan’s been dropped for now, the landslide did it once but it’s off now partly because they like a home winner and the current route gives Viviani, Trentin, Colbrelli and others a lot more chances than Nibali, Aru or Moscon at the moment. I think the route is good as it is now because it’s so open but this is always a moving story, what was insurmountable for the sprinters in the past is now manageable for them, the trend has been to make the race harder since the 1950s in order to provide a bigger challenge. The last few years threw different scenarios hence there was no tinkering with the route I guess. However I see the sprinters making it their race in the next few years. The level gets closer and closer and it is almost impossible to get away when the bunch climbs the Poggio at >35 kmh. It still beggars belief how Nibali did it last year:) The tension after his attack till the finish was almost unbearable. But as much as I loved it I can’t see it happening again anytime soon. Should we really have finishes from a bigger bunch for successive years I think the organisers might be inclined to change the route by adding the Pompeiana or another climb. And the most boring 5 hours to start..
I’m missing Le Manie. As bikes improve, and since distance is a given here, the only way to maintain the overall effort required constant throughout the years is to introduce a new climb every 10-15 years. No one wants to turn MSR into an Ardennes classic, but the possibilities of pure sprinters must remain the same as in Merckx’ or Fignon’s years. If you don’t touch the course, those possibilities increase a bit every year, which is a problem that Nibalis and Cancellaras don’t negate. I used to think that until I drove over the climb a few times during tours we ran over the route from the bottom of Turchino to Sanremo. I think it’s fine as-is. Since Manie was removed we’ve had Kristoff, Demare, Degenkolb, Kwiatkowski and Nibali. I’d hate to see it become a race only the guys who usually excel later at L-B-L could win. Great write up as usual. What a treasure, this website. I am going with Sagan to finally win, because he is not considered the overwhelming favorite (those often get neutralized in this race) & this might give him some room to breathe and win in a mid-size sprint…. So the capital of Kazakhstan is now Nursultan. As Inrng suggested will we see another new name in the peleton for the Giro? Five former winners in the current peloton, and none with more than one. It’s such a wide open race with so many possible winners. Merckx’s seven wins seems otherworldly. It’s probably the most remarkable achievement of his very numerous remarkable achievements. Should be a pretty interesting final this year. It’s basically Deceuninck-QS against everyone else, as I don’t see any climber dropping Alaphilippe and no sprinter beating Viviani (although Sam Bennett might run him close, if he can survive the Poggio). So all the other teams need to come up with something to unsettle DQS. Based on that, I think we’ll see a serious move before the Poggio this year, that could very well make it depending on who manages to make the cut. Leaving it late is basically playing into the hands of DQS, and you’d think most teams are done with that. True but any reasonably serious opportunist move prior to the Poggio or on its early slopes is likely to include either or both of Gilbert and Stybar. not to mention Lampaert. Highly likely, yes. Then again, I’d much rather go to the finish line with either Gilbert, Stybar or Lampaert than Alaphilippe or Viviani. I think we’re due another Ciolek/Goss type winner…. so it’s Dan Mclay all the way! As much as I’ve read that this is a course for all types of riders, I still maintain that with today’s bikes and riders’fitness, a GC rider *should* never win Milan-Sanremo. I found last year’s race to be immensely frustrating – ‘The Day That Sprinting Died’. My one wish for tomorrow is a finish worthy of 300 km effort, whoever comes out on top. “today’s bikes” Can you explain that? I like to think Vincenzo Nibali would have won in 2018 riding Evgeny Kobernyak’s bike, but perhaps you are implying something else? With respecto Larry, the finale to last year’s race was bordering on the ridiculous, for me. In fact, post-race perspective got so out of hand that Nibali was getting punted for De Ronde! He produced a great ride but ended up about where he should have in San Remo a fortnight earlier. Of course, you’re aware that Nibali had already got on Sanremo’s podium before, aren’t you? And that, out of the nine times he finished it, he made 3 top-ten finishes, which is quite notable for anyone not being a fast man at all? His results, historically speaking, aren’t unlike from fast men with a decent Sanremo history as Demare’s or, say, Matthews’ or Hushovd’s. In fact, they’re probably better, even when he was just finishing in the (selected) bunch. Not to speak of other previous winners or podiumers like Gerrans or Haussler. OTOH, and obviously enough, the first time *ever* you ride Flanders (! ), you can’t expect much more than prompting the winning move, final result aside; there’s less than a handful of very notable exceptions like Mads Pedersen last year or Vandebroucke back then, but that’s far from being the norm. Before winning his first Flanders, a certain Cancellara had ridden it seven times. He got a 6th place in the fourth of those seven attempts, but all the remaining ones were worse – and often *way* worse – than Nibali’s (you can excuse him being a youngster in the very first ones but, hey!, we’re speaking of *seven* attempts very far from the top 20 barring a couple of them). Boonen ended up like Nibali some three times before he won the race (although he showed since his first Roubaix what sort of gift he had). So it doesn’t make much sense to take that as a reference, even less to say that a rider *should* perform in Sanremo as he does in his first Flanders and not, well, as he already did before… in Sanremo. Perhaps one of modern cycling’s main flaws (or is it modern fans’?) is believing that a GC rider, as such, should be essentially a useless cyclist. It wasn’t an anti-Nibali point I was making Gabrielle. But a certain order to the universe was restored today. A GC man should not win Milan-Sanremo in this day and age. Nibali, with Valverde and Dumoulin, were in the hunt and that was to their immense credit and versatility. Luckily enough, that “certain order” has been constantly fought against decade after decade by both organisers and riders, in order to keep this race as open and emotional as it can be in its best moments. If it was just a sprintfest after the usual snoozefest, we’d better put it to bed for good. Races are getting adapted to the day and age in order to keep their spirit alive, and that’s how it should be: otherwise, we’d probably be watching 10-stage GTs which are raced day in and day out, with extremely long stages but no mountains in sight. Then, the GC men would probably be your current Sanremo contenders! Anyway, I wouldn’t be so sure that Alaphilippe, still 26, won’t be able to become a GC man someday. If it signed for Sky, Ineos I mean, he still could be the Frenchman whom Brailsford brings back to victory – and he’d probably have time to win five or six TdFs. By the way, Nibali collected once more a top-ten once in Sanremo. And, all in all, I believe that, although I liked the course best with the Mànie, it’s not necessary to change it, yet: with the current version (shorter run to the line when compared to, say, Cancellara’s years, albeit not the shortest ever) we’re having a good mix of results, which means that it works as it should. 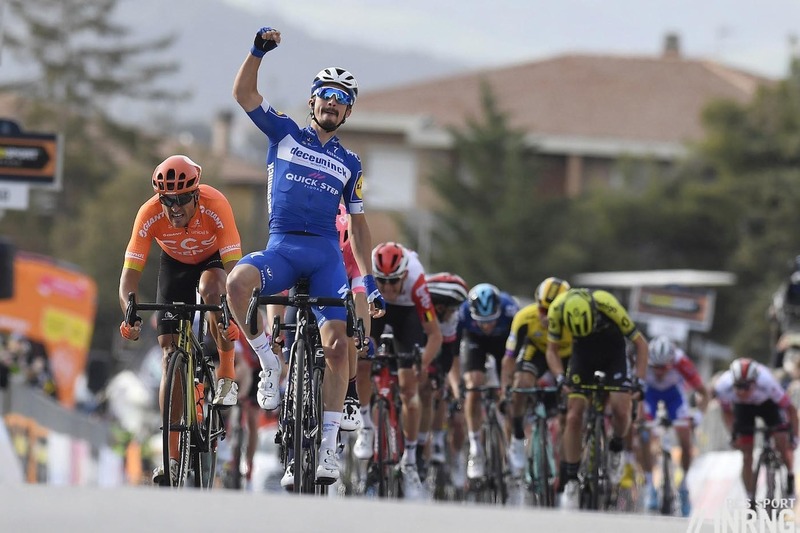 Alaphilippe was also the favorite for the world’s last year but just like then it seems that his path to winning is all the other strong riders failing. He can’t win the bunch sprint. Surely he can’t reasonably win solo – last year Sagan was almost playing team mate for Nibali. Anyway I can’t see him getting over the Poggio without a Sagan or Valverde who should reasonably out sprint him. And if the stars align and those guys aren’t there then he’ll probably have to do all the work. I don’t think Viviani is the top pick for the sprint either. But like I read somewhere, DQS seem to have forgotten how to lose so maybe it is their year. Hopefully they start playing their cards on the Cipressa.